Several years ago, I was sitting in a diocesan youth-ministry meet­ing. These monthly meetings were supposed to be for professional development. I can’t say I got a whole lot out of them, but the free lunch was always delicious, so I would usually go if I didn’t have anything more important to do. This didn’t sound like a good idea to me. Not only would the teens have to raise money for the diocese, but it was for a cause to which they had no strong commitment. I wondered how I was going to get teens excited to participate in this event. How Did They Convince Them? A year later, when the event took place, I found the answer to my question. How did the diocese get the youth to attend? They mandated that every Catholic-school student participate — ensuring that well over a thousand students were there. Parish youth ministries enticed teenagers to attend by promising them service hours as part of their preparation for Confirmation. There were thousands of young people at the event, and they raised more than ten thousand dollars for Catholic Charities. But it wasn’t an event for youth. It was a public-relations stunt. The diocese got great publicity because of the event, and one of their ministries received much-needed funding from it. There were thousands of Catholic teens in one place, celebrating being Catholic — except that they had no choice but to show up. They were at the event not because they were disciples of Jesus Christ who wanted to share their Faith with others but because they were required to be there. This event typifies Catholic youth ministry in America: we are good at getting young people to participate. Our programs, events, and ministries do a good job — perhaps better than any other denomination in the world — at getting teens in the door. This article is a preview from The Art of Forming Young Disciples. Click image to preview or order. Thousands of young Catholics attend World Youth Day every three years. Hundreds of thousands of teenagers in the United States attend Catholic youth conferences, mission trips, work camps, and Catholic camps. Hundreds of thousands are enrolled in Catholic youth programs in parishes every year (mostly for sacramental preparation). To be fair, many of these events are excellent, with much bet­ter intentions than the diocesan walk-a-thon that I mentioned. But is participation alone a good indicator of success? Do we really have many, many young people who are being formed in Catholicism, ensuring the passing on of our Faith for genera­tions to come? Unfortunately, if we look just a little past the surface, the news is not good. In fact, Catholic youth ministry is a catastrophe. Recently I attended the expo of a large youth-ministry training conference. There were booths selling all kinds of resources and services for youth ministry: video resources, textbooks, parish programs, and youth-ministry books. There were recruiters for certification programs for youth ministry and for undergraduate and graduate degrees from major universities. There were booths with information about youth camps, conferences, mission trips, work camps, retreat centers, and events of every kind offered all over the country. There were speakers, musicians, and entertainers. There was Catholic music played everywhere, T-shirts for sale, and apps for iPhones. If you could think of it, it was there. As I walked around the expo, one thought occurred to me: if we are losing our young people in the Church today, it isn’t due to lack of effort. Nor is it due to a lack of good resources and programs. In fact, I really liked a lot of the products and services I saw offered at the expo. Lack of effort is not the problem. Between the millions of dollars that the Church has invested in Catholic secondary education, and the time, talent, and treasure invested in youth ministry, young people get more attention from the Catholic Church than does any other ministry or demographic. Why is there so little return on that investment? More importantly, why is the Church failing to make young disciples? One year, while I was a youth minister working in a parish, the parish hosted a mission intended to help Catholics dive deeper into Scripture. At the Sunday Masses, the speaker encouraged all the parishioners to come to his presentation on Monday night and to bring their Bibles. I took a handful of the teens in my youth ministry to the presentation. They all brought their Bibles, and we sat in the front row. The speaker started the presentation by asking everyone to open their Bibles to a certain verse in the book of Leviticus. Vir­tually every adult sitting around us struggled simply to find the book in his Bible. I looked at my row of teens. Not only did they all have their Bibles open to the correct verse, but I noticed that every single one of the teens’ Bibles was littered with handwrit­ten notes, highlights, underlined verses, and sticky notes. All of their Bibles were worn and weathered because the teens had been reading and studying their Bibles. In fact, their Bibles looked a lot like mine. This is a simple example that demonstrates discipleship: the disciple imitates the rabbi. I believe discipleship is marked by three characteristics: it is a process, it is an apprenticeship, and it involves practicing discipline. Much within our faith life operates as a process. We don’t receive all the sacraments at once: they are conferred on us over the course of our lives. In the Rite of Christian Initiation of Adults (RCIA), a person goes through the stages of pre-evangelization, evangelization, conversion, catechesis, initiation, and mystagogia as he is initiated into the Catholic Faith. Initial trust: A person is not practicing Catholicism, but has a positive association with Jesus Christ, His Church, the Blessed Virgin Mary, a person in the Church, or some­thing else related to the Catholic Faith. Spiritual curiosity: A person is intrigued by Jesus Christ and desires to know more about Him and His Church but is not yet at a level of openness to life change. Spiritual openness: A person acknowledges to himself and to God that he is open to the possibility of personal and spiritual change (also known as conversion), but there is no commitment yet. Spiritual seeking: A person actively seeks to know the God who is calling him. He seeks to know and under­stand Christ and His Church. Intentional disciple: A person makes the decision to drop everything and follow Jesus. Discipleship doesn’t happen in an instant: it’s an ongoing process in life. This is why Jesus extends the invitation to Peter, James, An­drew, and John to come and follow Him. They were plying the trade of their father; their opportunity to become disciples of another rabbi had come and gone, and they hadn’t been cho­sen. Jesus, the greatest rabbi ever, gave each of these apostles a second chance. As a disciple lived with a rabbi to learn from his daily ex­ample, so the apostles learned from the words of Jesus — from His words, yes, but even more from His manner of praying, the way He handled difficult situations, His daily routines, and His example. They knew Him intimately, and after He ascended into Heaven, they imitated His practices as the Church was born. Discipleship is not discipleship without mentoring. A disciple must first be inspired to follow the rabbi and then be impacted by his living example. In discipleship, the Faith is not taught; it is caught. It is experiential in nature: the disciple learns by following the example of the rabbi. The words disciple and discipline come from the Latin word discere, “to learn.” A disciple learns to be a disciplined person in everyday life. This means that disciples practice habits, and those habits lead to deeper conversion. Most importantly, these practiced disciplines lead to a personal relationship with Christ — a relationship in which the disciple makes Jesus Christ the Lord and Savior of his life. If a young person becomes a lifelong follower of Christ, the following habits will likely be visible in his life: regular visits to the Blessed Sacrament; weekly or even daily Mass attendance; daily prayer, including the Rosary; reading and studying Scripture; intentional growth in virtue and service; and tithing. This is what we want — to form our young people into lifelong followers of Jesus Christ and His Church through the process of discipleship. A pastor will say that he lacks the funds necessary to hire a capable youth minister. A pastor will say that he can’t find or keep a qualified youth minister. A youth minister will say that her pastor is not supportive. A parent will say that her teen doesn’t like the youth group and doesn’t connect with the youth minister. A youth minister will complain that parents are dis­engaged and aren’t supportive of their teenagers’ faith. A parent will complain that the Catholic school isn’t doing a good job teaching the core doctrines of the Faith. A Catholic-school teacher will complain that parents are not modeling the Faith for their children at home. A parent will complain that the church youth group or religious-education program is little more than stale pizza, lame entertainment, and a boring curriculum. A parent will state that he is waiting for the pastor to fire the middle-aged DRE who is underqualified for work­ing with young people and out-of-touch with modern methods of ministry. A diocesan director will observe that parish leadership lacks vision, so that teens end up planning their own ministry, or pastors and youth leaders end up pinning their hope of success on the latest program and resources. A bishop will observe that youth-ministry events in his diocese are all hype, flash, and entertainment, and no substance. A teenager will complain that the Church doesn’t un­derstand teens and that their questions about God and faith aren’t being answered. Any one of these statements may be true, but not a single one of them correctly identifies the problem in the Church today. These are symptoms of a greater problem: we don’t understand young people and how to meet their most basic needs. If we don’t understand the problem, we can never hope to solve it. Youth ministry, as traditionally organized, has also suffered the impact of social changes. Young people often fail to find responses to their concerns, needs, problems, and hurts in the usual structures. As adults, we find it hard to listen patiently to them, to appreciate their concerns, demands, and to speak to them in a language they can understand. For the same reason, our efforts in the field of education do not produce the results expected. The structures our Church uses to minister to young people are not meeting their basic needs, and because of this, our young people are failing to become disciples. It’s not enough to have the best resources money can buy — a youth minister, a Catholic school — or to be catechizing a large number of teens. The landscape of youth culture is changing, but the Church has not adapted to these changes. In fact, in some cases, parishes are implementing approaches to youth formation that haven’t been updated in more than four hundred years. Our Church is facing a crisis — we are hemorrhaging young people. For decades, the Church has been talking of a New Evan­gelization — a kind of new birth or revolution of the gospel in the Church. But no major revolution in the world has ever thrived without a youth movement. The Church cannot reinvigorate her members so long as her young people are uninspired. 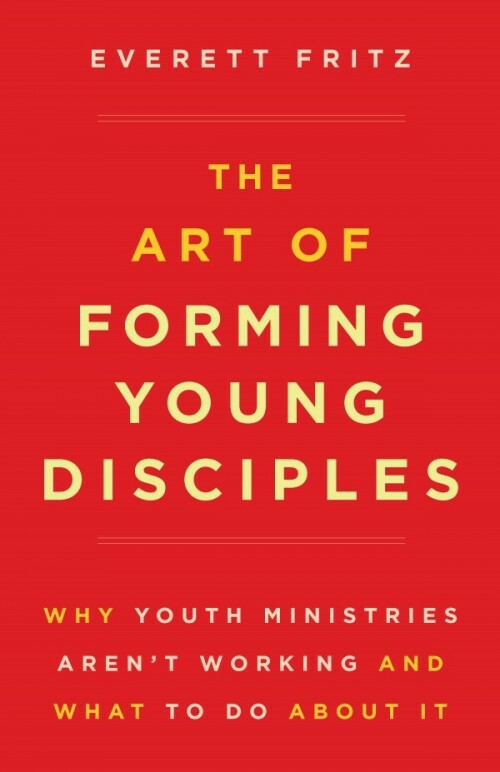 Editor’s note: This article is a special preview of The Art of Forming Young Disciples, courtesy of Sophia Institute Press. Everett Fritz is the founder and Executive Director of St. Andrew Missionaries. Everett holds an MA in Theology from the Augustine Institute and a BA in Theology from Franciscan University of Steubenville. He authored the best selling book, Freedom: Battle Strategies for Conquering Temptation - a guide for young men trapped in the shackles of sexual sin. Everett regularly speaks on the topics of discipleship, youth evangelization and chastity. Everett and his wife Katrina reside in Denver, Colorado with their children.